Innovation is made by people. But most innovators are not natural born entrepreneurs. They are not lone heroes creating single-handedly revolutionary products. They are ordinary people, often within existing firms, who decide to change things and are ready to cope with the resulting uncertainties. Corporate entrepreneurs do not plan, do, check and act like traditional managers. They focus on finding and mobilizing available resources in order to identify, assess and launch new initiatives, while adjusting goals and expectations along the way. Entrepreneurial intentions and behaviors can be managed and fostered. Tolerance for failure, reward systems, role models and norms, as well as skill development and slack resources can create the right attitudes, norms and perceptions. (Book) Drucker, Peter. Innovation and entrepreneurship. Routledge, 2014. (Book) Morris, M. H., Kuratko, D. F., & Covin, J. G. (2010). Corporate entrepreneurship & innovation. Cengage Learning. (Article) Antoncic, B., & Hisrich, R. D. (2001). Intrapreneurship: Construct refinement and cross-cultural validation. Journal of Business Venturing, 16(5), 495-527. (Article) Audia, P. G., & Rider, C. I. (2005). A garage and an idea: what more does an entrepreneur need?. California Management Review, 48(1), 6-28. (Article) Augusto Felício, J., Rodrigues, R., & Caldeirinha, V. R. (2012). The effect of intrapreneurship on corporate performance. Management Decision, 50(10), 1717-1738. (Article) Baumol, W.J. (1996). Entrepreneurship: Productive, unproductive, and destructive. Journal of Business Venturing, 11(1), 3-22. (Article) Begley, T. M., & Boyd, D. P. (1987). Psychological characteristics associated with performence in entrepreneurial firms and smaller businesses. Journal of Business Venturing, 2(1), 79-93. (Article) Block, J.H., Fisch, C.O., & Van Praag, M. (2017). The Schumpeterian entrepreneur: a review of the empirical evidence on the antecedents, behaviour and consequences of innovative entrepreneurship. Industry and Innovation, 24(1), 61-95. (Article) Brandstätter, H. (2011). 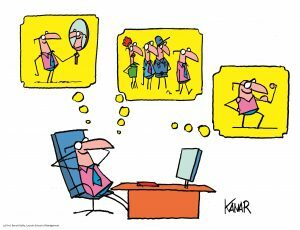 Personality aspects of entrepreneurship: A look at five meta-analyses. Personality and individual differences, 51(3), 222-230. (Article) Burgelman, R.A. (1983). Corporate entrepreneurship and strategic management: Insights from a process study. Management Science, 29(12), 1349-1364. (Article) Bygrave, William D., and Charles W. Hofer. “Theorizing about entrepreneurship.” Entrepreneurship theory and Practice 16.2 (1991): 13-22. (Article) Covin, J.G., & Miles, M.P. (1999). Corporate entrepreneurship and the pursuit of competitive advantage. Entrepreneurship: Theory and Practice, 23(3), 47-47. (Article) Eckhardt, J. T., & Shane, S. A. (2003). Opportunities and entrepreneurship. Journal of Management, 29(3), 333-349. (Article) Gatewood, E. J., Shaver, K. G., & Gartner, W. B. (1995). A longitudinal study of cognitive factors influencing start-up behaviors and success at venture creation. Journal of Business Venturing, 10(5), 371-391. (Article) Kerr, S. P., Kerr, W., & Xu, T. (2017). Personality Traits of Entrepreneurs: A Review of Recent Literature. Harvard Business Review. (Article) Shane, S. & Venkataraman, S. (2000). The promise of entrepreneurship as a field of research. Academy of Management Review, 25(1), 217-228. (Article) Sharma, P., & Chrisman, J.J., (1999). Toward a reconciliation of the definitional issues in the field of corporate entrepreneurship. Entrepreneurship Theory and Practice. 23(3), 11–27. (Book) Sarasvathy, S. D. (2009). Effectuation: Elements of entrepreneurial expertise. Edward Elgar Publishing. (Book) Bruno Latour, Pandora’s Hope: Essays on the Reality of Science Studies (Cambridge, MA: Harvard University Press, 1999). (Article) Abrahamson, Eric, and Lori Rosenkopf. “Social network effects on the extent of innovation diffusion: A computer simulation.” Organization science 8.3 (1997): 289-309. (Article) Adler, P. S., & Kwon, S. W. (2002). Social capital: Prospects for a new concept. Academy of Management Review, 27(1), 17-40. (Article) Alvarez, S.A., & Barney, J. (2005). How entrepreneurs organize firms under conditions of uncertainty. Journal of Management, 31(5), 776-793. (Article) Baer, M. (2012). Putting creativity to work: The implementation of creative ideas in organizations. Academy of Management Journal, 55(5), 1102-1119. (Article) Baker, T. & Nelson, R.E., (2005). Creating Something from Nothing: Resource Construction through Entrepreneurial Bricolage, Administrative Science Quarterly, 50, 329-366. (Article) Brown, T.E., Davidsson, P., & Wiklund, J. (2001). An operationalization of Stevenson’s conceptualization of entrepreneurship as opportunity‐based firm behavior. Strategic Management Journal, 22(10), 953-968. (Article) Corbett, A. C. (2007). Learning asymmetries and the discovery of entrepreneurial opportunities. Journal of Business Venturing, 22(1), 97-118. (Article) Daft, R. (1978). ‘A Dual-Core Model of Organizational Innovation’. Academy of Management Review, 21, 193-210. (Article) Fisher, G. (2012). Effectuation, causation, and bricolage: A behavioral comparison of emerging theories in entrepreneurship research. Entrepreneurship Theory and Practice, 36(5), 1019-1051. (Article) Forbes, D. P. (2005). Are some entrepreneurs more overconfident than others?. Journal of Business Venturing, 20(5), 623-640. (Article) Gaglio, C.M., & Katz, J.A. (2001). The psychological basis of opportunity identification: entrepreneurial alertness. Small Business Economics, 16(2), 95-11. (Article) Gartner, W. B., Bird, B. J., & Starr, J. A. (1992). Acting as if: Differentiating entrepreneurial from organizational behavior. Entrepreneurship Theory and Practice, 16(3), 13-31. (Article) Garud, R., & Karnøe, P. (2003). Bricolage versus breakthrough: distributed and embedded agency in technology entrepreneurship. Research Policy, 32(2), 277-300. (Article) Grant, A. M., & Ashford, S. J. (2008). The dynamics of proactivity at work. Research in organizational behavior, 28, 3-34. (Article) Gumpert, D. E., & Stevenson, H.H. (1985). The heart of entrepreneurship. Harvard Business Review, 63(2), 85-94. (Article) Howell, J. M., Shea, C. M., & Higgins, C. A. (2005). Champions of product innovations: defining, developing, and validating a measure of champion behavior. Journal of Business Venturing, 20(5), 641-661. (Article) Ibarra, H. (1993). Network centrality, power, and innovation involvement: Determinants of technical and administrative roles. Academy of Management Journal, 36(3), 471-501. (Article) Klepper, S. (2001). Employee startups in high‐tech industries. Industrial and Corporate Change, 10(3), 639-674. (Article) Kuratko, D. F. (2007). Corporate entrepreneurship. Foundations and Trends® in Entrepreneurship, 3(2), 151-203. (Article) Kuratko, D. F., Ireland, R. D., Covin, J. G., & Hornsby, J. S. (2005). A Model of Middle–Level Managers’ Entrepreneurial Behavior. Entrepreneurship Theory and Practice, 29(6), 699-716. (Article) Maidique, M. A. (1980). Entrepreneurs, champions, and technological innovation. Sloan Management Review (pre-1986), 21(2), 59. (Article) Mathias, B. D., & Williams, D. W. (2017). Giving up the hats? Entrepreneurs’ role transitions and venture growth. Journal of Business Venturing. (Article) Obstfeld, D. (2005). Social networks, the tertius iungens orientation, and involvement in innovation. Administrative Science Quarterly, 50(1), 100-130. (Article) Peñalver, M. J. P., Mas, L. E. A., & Fleta, B. M. (2018). Identification and classification of behavioural indicators to assess innovation competence. Journal of Industrial Engineering and Management, 11(1), 87-115. (Article) Perry-Smith, J. E., & Mannucci, P. V. (2017). From creativity to innovation: The social network drivers of the four phases of the idea journey. Academy of Management Review, 42(1), 53-79. (Article) Rodan, S., & Galunic, C. (2004). More than network structure: How knowledge heterogeneity influences managerial performance and innovativeness. Strategic Management Journal, 25(6), 541-562. (Article) Salunke, S., Weerawardena, J., & McColl-Kennedy, J.R. (2013). Competing through service innovation: The role of bricolage and entrepreneurship in project-oriented firms. Journal of Business Research, 66(8), 1085-1097. (Article) Salvato, C. (2009). Capabilities unveiled: The role of ordinary activities in the evolution of product development processes. Organization Science, 20(2), 384-409. (Article) Sergeeva, N. (2016). 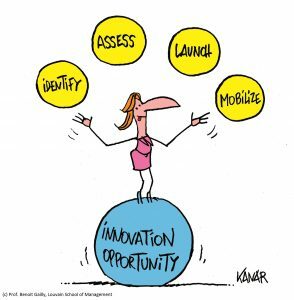 What makes an “innovation champion”?. European Journal of Innovation Management, 19(1), 72-89. (Article) Stevenson, Howard, and Susan Harmeling. “Entrepreneurial management’s need for a more “chaotic” theory.” Journal of Business Venturing 5.1 (1990): 1-14. (Article) Teece, D. J. (2012). Dynamic capabilities: Routines versus entrepreneurial action. Journal of Management Studies, 49(8), 1395-1401. (Article) Ajzen, I. (2001) “Nature and operation of attitudes” Annual Review of Psychology, 52(27-58). (Article) Anderson, N., & King, N. (1991). 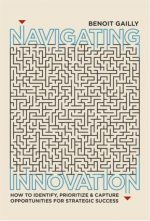 Managing innovation in organisations. Leadership & Organization Development Journal, 12(4), 17-21. (Article) Campos, F., Frese, M., Goldstein, M., Iacovone, L., Johnson, H. C., McKenzie, D., & Mensmann, M. (2017). Teaching personal initiative beats traditional training in boosting small business in West Africa. Science, 357(6357), 1287-1290. (Article) Carter, N. M., Gartner, W. B., Shaver, K. G., & Gatewood, E. J. (2003). The career reasons of nascent entrepreneurs. Journal of Business Venturing, 18(1), 13-39. (Article) Chen, H. S., Mitchell, R. K., Brigham, K. H., Howell, R., & Steinbauer, R. (2018). Perceived psychological distance, construal processes, and abstractness of entrepreneurial action. Journal of Business Venturing. (Article) Dimov, D. (2007). From opportunity insight to opportunity intention: The importance of person‐situation learning match. Entrepreneurship Theory and Practice, 31(4), 561-583. (Article) Eisenberger, R., & Cameron, J. (1996). Detrimental effects of reward: Reality or myth?. American Psychologist, 51(11), 1153. (Article) Fitzsimmons, J. R., & Douglas, E. J. (2011). Interaction between feasibility and desirability in the formation of entrepreneurial intentions. Journal of Business Venturing, 26(4), 431-440. (Article) Garcia-Morales, V., Llorens-Montes, F., & Verdu-Jover, A. (2007). ‘Influence of personal mastery on organizational performance through organizational learning and innovation in large firms and SMEs’. Technovation, 27, 547-568. (Article) Gartner, W. B. (1988). “Who is an entrepreneur?” is the wrong question. American Journal of Small Business, 12(4), 11-32. (Article) Hornsby, J.S., Kuratko, D.F. & Zahra, S.A. (2002). Middle managers’ perception of the internal environment for corporate entrepreneurship: assessing a measurement scale. Journal of Business Venturing, 17(3), 253-273. (Article) Kang, J., Solomon, G., & Choi, D. (2015). ‘CEO’s Leadership Styles and Managers’ Innovative Behaviour: Investigating of Intervening Effects in an Entrepreneurial Context’. Journal of Management Studies, 52, 531-554. (Article) Ko, S., & Butler, J. E. (2007). Creativity: A key link to entrepreneurial behavior. Business Horizons, 50(5), 365-372. (Article) Krueger Jr, N. F., Reilly, M. D., & Carsrud, A. L. (2000). Competing models of entrepreneurial intentions. Journal of Business Venturing, 15(5-6), 411-432. (Article) Locke, E. A., & Latham, G. P. (2002). Building a practically useful theory of goal setting and task motivation: A 35-year odyssey. American Psychologist, 57(9), 705. (Article) Madjar, N., Chen, Z., & Greenberg, E. (2011). ‘Factors for Radical Creativity, Incremental Creativity, and Routine, Noncreative Performance’. Journal of Applied Psychology, 96, 730-743. (Article) Marvel, M.R., Griffin A., Hebda J., & Vojak B. (2007). Examining the technical corporate entrepreneurs’ motivation: Voices from the field. Entrepreneurship Theory and Practice, 31(5), 753-768. (Article) Michaelis, T. L., & Markham, S. K. (2017). Innovation Training: Making Innovation a Core Competency A study of large companies shows that, although managers see human capital as central to innovation success, most aren’t providing innovation training. Research-Technology Management, 60(2), 36-42. (Article) Mueller, S. L., & Thomas, A. S. (2001). Culture and entrepreneurial potential: A nine country study of locus of control and innovativeness. Journal of Business Venturing, 16(1), 51-75. (Article) Nohria, N., & Gulati, R. (1996). Is slack good or bad for innovation?. Academy of Management Journal, 39(5), 1245-1264. (Article) Perry, S.J., Hunter, E., & Curall, S. (2016). ‘Managing the innovators: Organizational and professional commitment among scientists and engineers’. Research Policy, 45, 1247-1262. (Article) Rigtering, J. P. C., & Weitzel, U. (2013). Work context and employee behaviour as antecedents for intrapreneurship. International Entrepreneurship and Management Journal, 9(3), 337-360. (Article) Shepherd, D. A., & Krueger, N. F. (2002). An intentions–based model of entrepreneurial teams’ social cognition. Entrepreneurship Theory and Practice, 27(2), 167-185. (Article) Shook, C.L., Priem, R.L. & McGee, JE (2003). “Venture creation and the enterprising individual: a review and synthesis”, Journal of Management, 29(3), 379-399. (Article) Sonenshein, S. (2014). How organizations foster the creative use of resources. Academy of Management Journal, 57(3), 814-848. (Article) Yanadori, Y., & Cui, V. (2013). 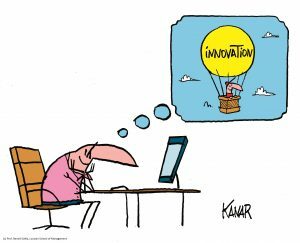 ‘Creating incentives for innovation? The relationship between pay dispersion in R&D groups and firm innovation performance’. Strategic Management Journal, 34, 1502-1511. (Article) Zahra, S.A. (1991). Predictors and financial outcomes of corporate entrepreneurship: An exploratory study. Journal of Business Venturing, 6(4), 259-285.